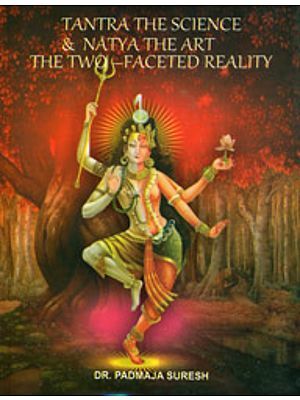 In this book the author discusses the place of science in rituals and mantras. 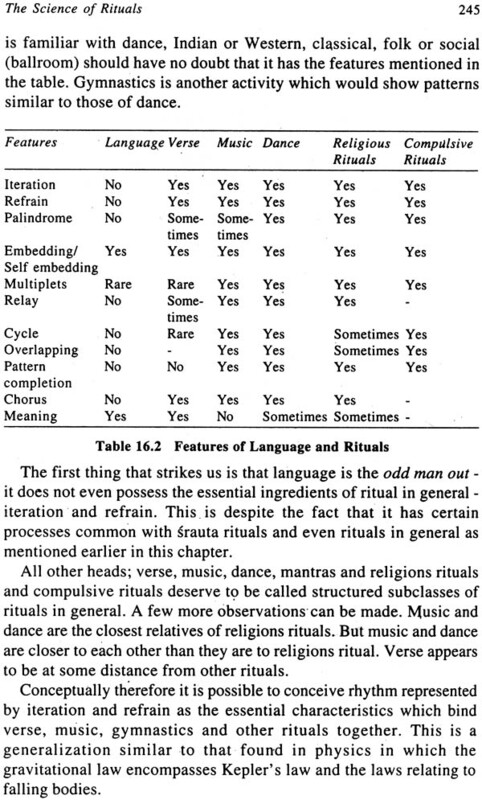 Using structural analysis he show that rituals in general, whether religious, political, social or otherwise have common structural patterns. These patterns are shared by poetry, music, dance and gymnastics, but not by language. 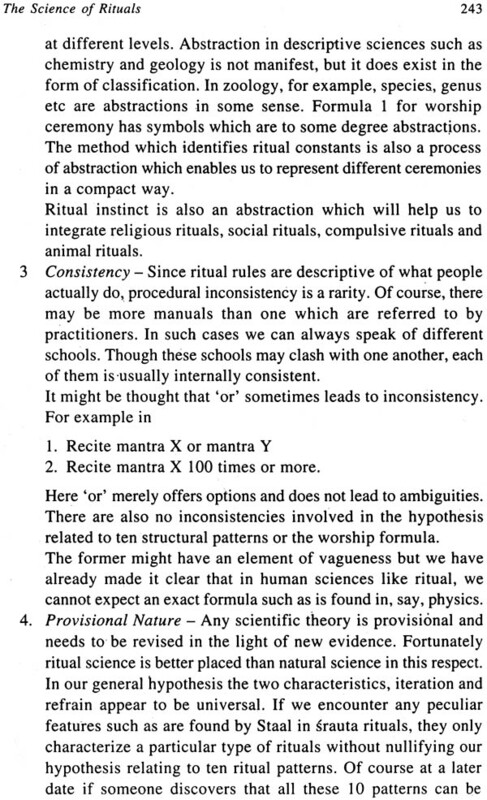 Consideration of animal rituals and pathological (compulsive) rituals leads him to propose a general theory which unifies all ritual-like activities. 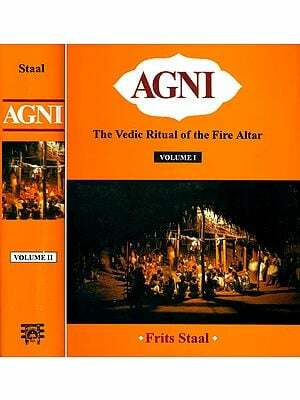 He also introduces the concept of ritual instinct which can be make the theory simpler and more elegant. 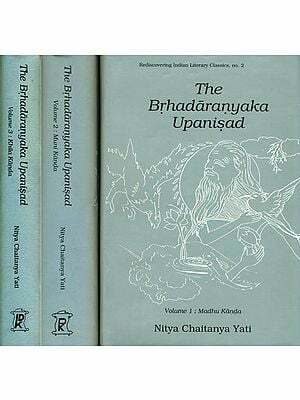 He shows how knowledge can divided into science, non-science and pseudo-science to understand the true status of such strange phenomena as miracles, supernatural powers, siddhis, samadhi, rebirth and ESP. Jayant Burde received his M.Sc. degree in mathematics from Bombay University and a law degree from Bangalore University. He is also a Certificated Associated of the Indian Institute of Bankers. He was in business before he joined a bank where he worked for nearly 20 years. His published papers contain mathematical models in finance, costing and organizational structure. 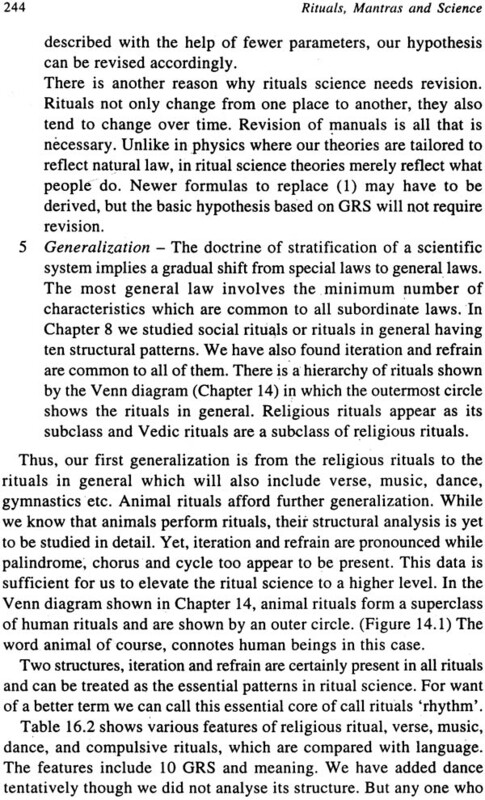 In this new book on Rituals, Mantras and Science, Jayant Burde generously acknowledges his debt to my 1989 book Rules without Meaning: Ritual Man and the Human Sciences (in the 1996 Indian edition: Ritual and Mantras. Rules without Meaning). I am pleased, of course, by such recognition but that is not the reason that I am writing this Preface. The reason is that Burde has gone significantly beyond what I had tried to do and has reached conclusions that are not only entirely new and unforeseen by me, but that are of special relevance today. But to begin with the beginning - the author has broadened the scope of the subject considerably. 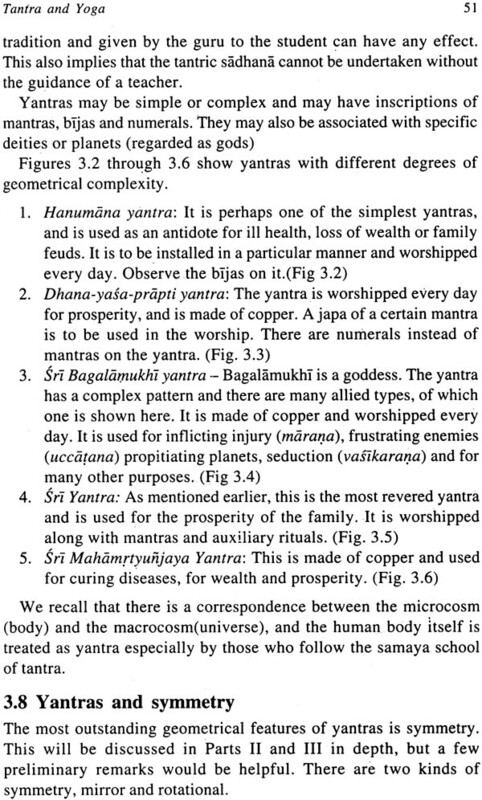 While my empirical foundation was largely confined to Vedic ritual, Burde has taken account of later developments such as Tantric ritual and Puja ceremo nies a well as compulsive (pathological) rituals, animal rites and other forms of instinctive behaviour. He has widened the comparison with other human activities that are similarly structured by including domains such as poetry: He has lifted the discussion to a new level by embedding it in an original theory of science. It is in this connection that he introduces clear distinctions and criteria for distinguishing science from pseudo-science and non-science. In so doing he performs a service to the scholarly community but goes at the same time beyond the scholar's ivory tower and opens up a contemporary perspective. His analysis is relevant to the present situation in India where ritual traditions remain strong but claims about their supernatural effects have also risen to unprecedented heights. With a new educational program called "Vedic Mathematics", which is neither Vedic nor mathematics being pushed from above' and for political reasons, Burde's work takes on a new dimension of relevance. Ritual, Mantras and Science should be studies and pondered not only by those who are interested in contemporary India, but by every thinking Indian. 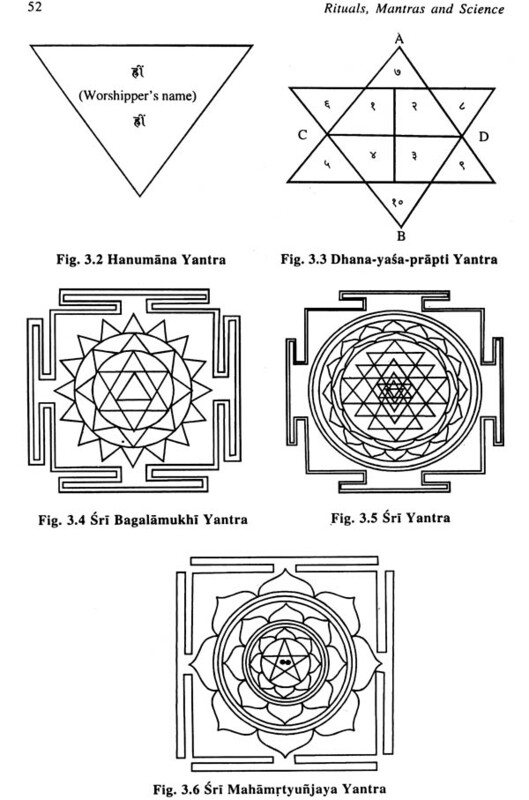 This book discusses the place of science in rituals and mantras. Though serious in tone, it is addressed to a general audience and all the tools necessary to understand the various concepts are introduced at appropriate places especially in Part II. I hope that part from the common reader, the students of religion, science, philosophy and sociology will find the book interesting because it uses the less known approach of structural (syntactic) analysis. Frits Staal uses it in his seminal work Ritual and Mantras: Rules without Meaning in which he shows that there was, in ancient India,a science of ritual and mantras. Staal's treatise was the most important stimulus which motivated me to write this book. This volume, however, differs from his book in some respects. First it is not confined to Vedic rituals but analyzes the structure of the contemporary rituals sourced from the Vedas, Puranas and tantra. Second, there are a few areas of disagreement which has made me take a route which differs from Staal's but which has enabled me to integrate religious rituals with rituals in general, pathological (compulsive) rituals and animal rituals. 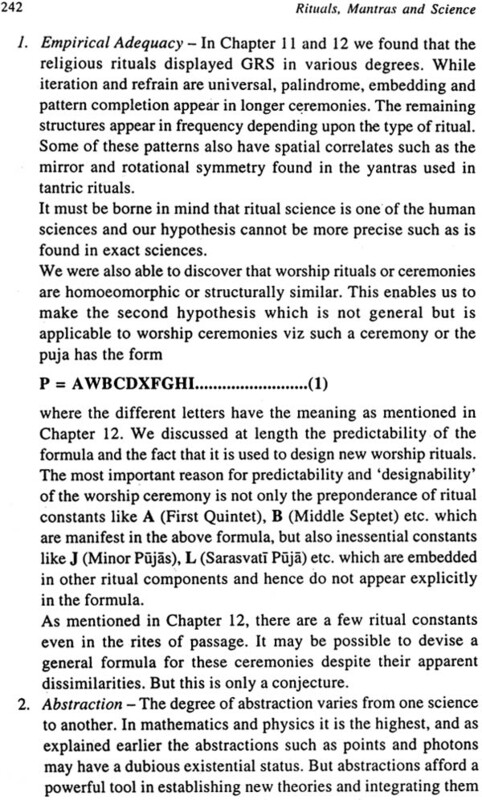 This has also led me to present a general theory of rituals which unifies all types of ritual activities. Third, the book discusses non-science, science and pseudo-science and shows how the scientific knowledge of different types including those related to supernatural powers and siddhis, which the ancient Indian text are believed to contain, can be categorized appropriately. It is difficult to name all those who contributed to creation of this work, and to whom I am indebted. Prof Staal's influence is reflected throughout the book. The works of those authors listed in the Bibliography have been of great help. I must to particularly refer to the author whose writings in Indian languages provided me with wealth of information relating to current rituals. I am grateful to Mr. Rajendra P. Jain of MLBD without whose help and encouragement the project would have remained a pipedream. In Dr. Bhavsar, who went through the manuscript and made valuable suggestions, I found a sincere guide. Indians are proud of their ancestors who have made valuable contributions to the various fields of learning; arts, literature, grammar, mathematics, astronomy, medicine and many others. Their most outstanding contribution is undoubtedly the decimal system of numbers and the concept of zero. 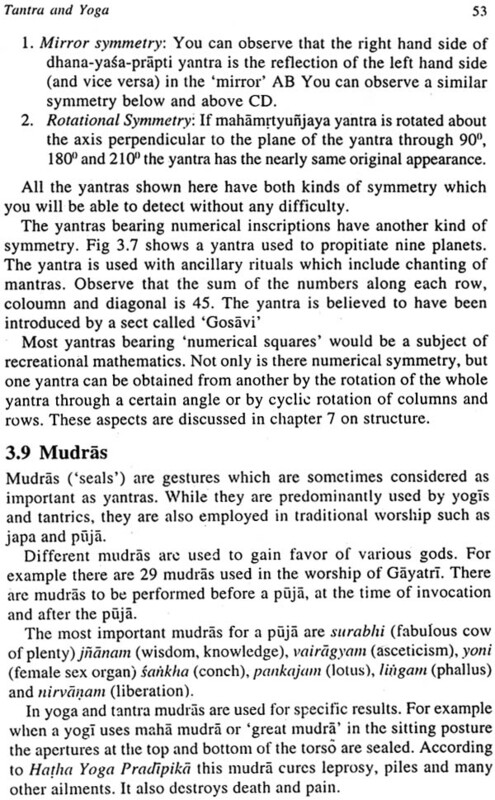 Of course, a similar vigesimal numerical system (with twenty as the base) was used in the Maya in Central America much before, but the world at large did not benefit from it. However, when the ancestral pride is excessive and rooted in superstition, it becomes ancestor worship. Many of us are guilty of regarding our forebears as gods. 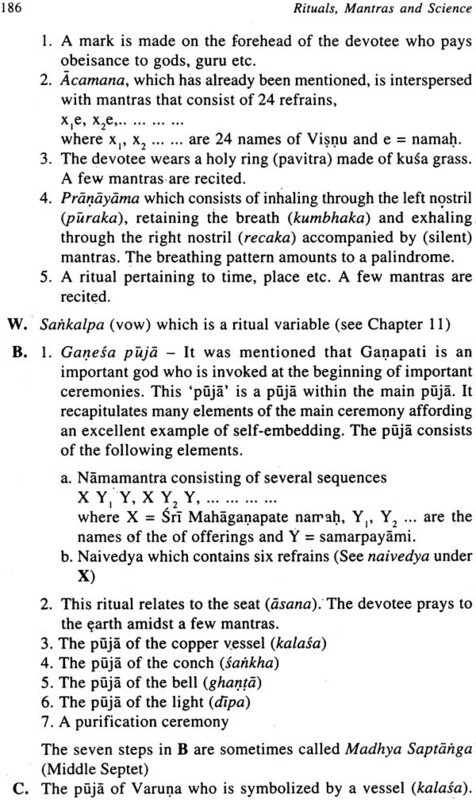 There are many Indians, some of them highly educated, who believe that rainfall will occur if you recite in Sanskrit) a mantra such as the following a certain number of times, and perform some ancillary rituals. O Varuna, we praise you. Release us from the fetters. We deserve to be protected by you. Always protect us. (Varuna is the personification of all-investing sky) If you try this method, you are likely to fail unless you recite the mantra when there are dark clouds in the sky, and even a child can tell you that it will soon start pouring. But if the rain-mantra fails, it does not dishearten the ancestor-worshippers: the failure can be easily rationalized. It can be contended that nobody in modem times knows exactly how the mantra should be chanted as prescribed in the ancient texts. The 'science' was lost in the Dark Ages. They also believe that the ancient Indians were far advanced in science and technology. They built aeroplanes and missiles, and used radio and television. It is even suggested that they had mastered genetic engineering. According to the epic Mahabharata, King Dhrtarastra had 100 sons (Kauravas) from his wife Gandhari. Since this is not possible through the normal reproductive method; it has been suggested that some of the Kauravas were clones. While many of us see a science, where none exists, in the ancient texts, most of us are not aware of the sciences which really prevailed in ancient India. How many of us know that the science of linguistics was born in India long ago, and the West accepted it as science only recenlty? It must be mentioned that a true scientist is not a pathological skeptic; he has an open mind. 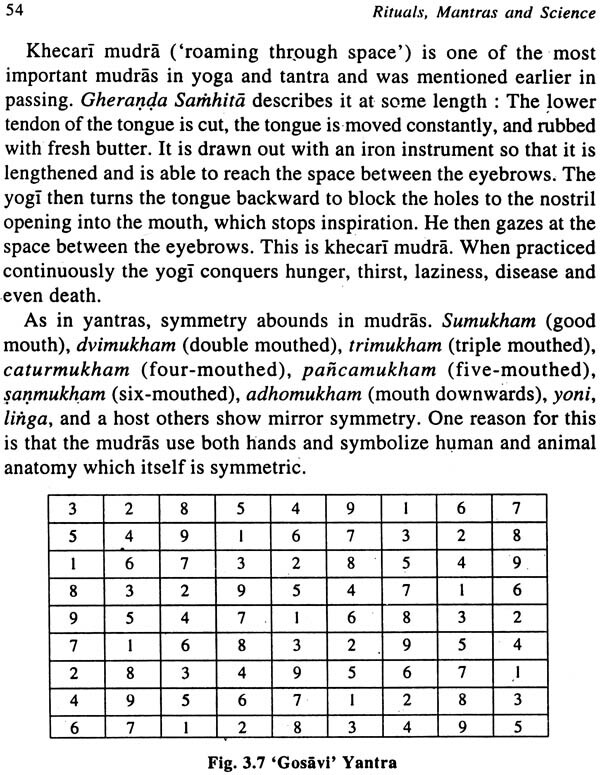 If a number of experiments show that there exists a probability that the rain-mantra is effective or that some of the supernatural powers (siddhis) mentioned in Patafijalis Yoga Sutra can be acquired, he will start developing a coherent theory for these phenomena, instead of ridiculing the claims. But while there may not be much science in rituals and mantras, there can be a science of them, as we shall see later. 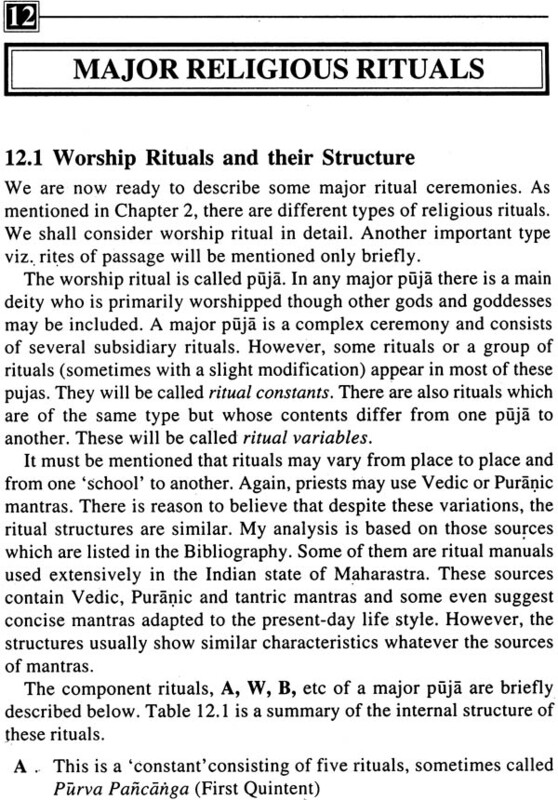 There are basically two methods of studying ritual. The first method is the most widely used, and is sometimes called the semantic approach. It is concerned with the meaning of ritual. Suppose you observe a devotee who offers oblations to a god and utters a mantra, "O God, bestow upon me health and wealth". The ritual is quite intelligible and you understand its goal. However, not all rituals are so easy to understand. Suppose you find a priest utter the following incantation. 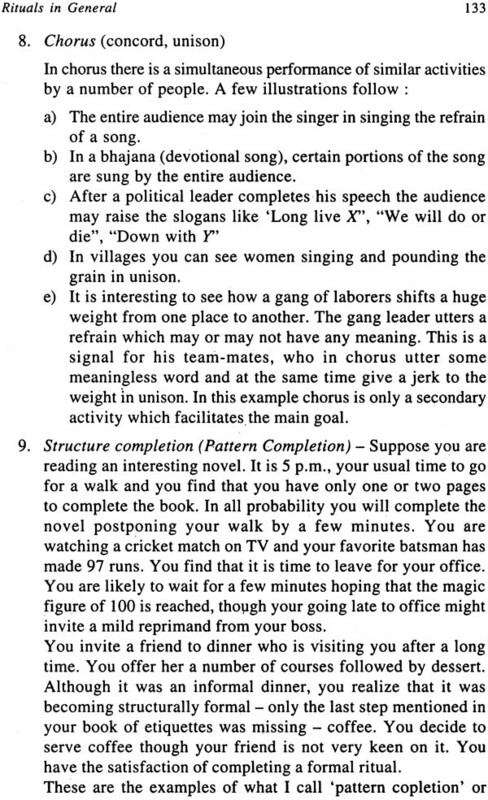 followed by a few gestures, which do not convey any meaning to you. 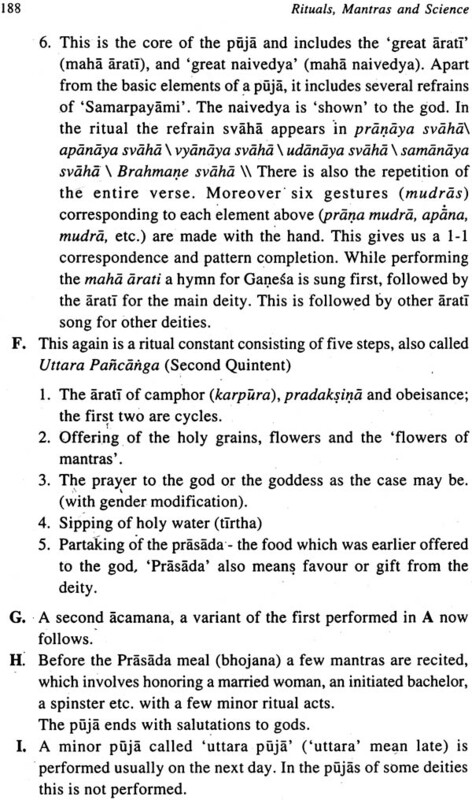 The ritual makes no sense even to a person who knows Sanskrit, and needs to be interpreted. Several scholars from different fields may be involved in this task: the elders in the community who claim to have witnessed similar ceremonies before, scholars of religion, mythologists who interpret various symbols, sociologists who are particularly acquainted with the society in which the ritual prevails, social anthropologists, psychoanalysts, linguists, historians, and a host of other specialists who may have something to say about ritual. More often than not, no unanimous interpretation emerges. 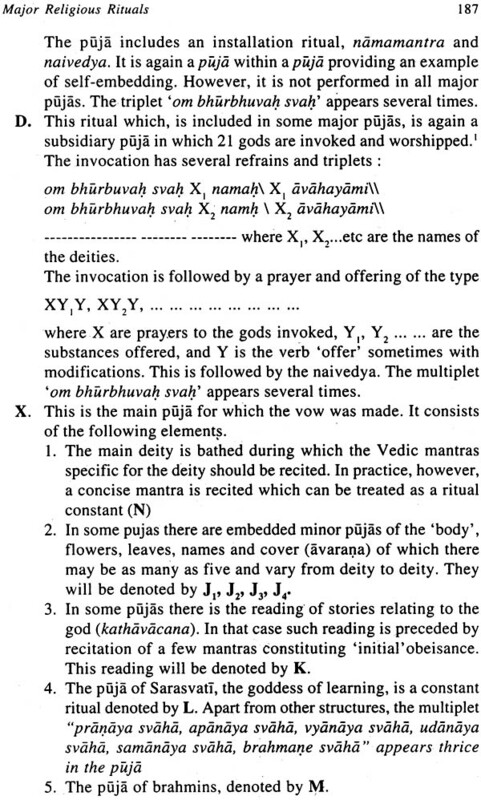 Depending up on the status of the interpreters a few interpretations may be considered important, and will find a place in the commentaries on rituals and mantras. As time passes, the ritual will be handed down to the next generation. The experts from the new generation will not only examine the ritual, but will also consult the earlier interpretative texts. They will write their own commentaries, adding their own views. This process of interpreting and re-interpreting the ritual will continue generation after generation. After many centuries we will find that a given ritual has hundreds of interpretations, some of them diametrically opposite to others. You do not understand its meaning, but after hearing it repeated several times you may observe some of its features. 1 'Hrim' occurs four times in the line. 2 'Strim' occurs four times in the line. 3 Hum' occurs four times in the line. 4 The mantra is repeated, say, 1000 times. 5 The mantra reads the same from the right to the left as it reads from the left to the right. 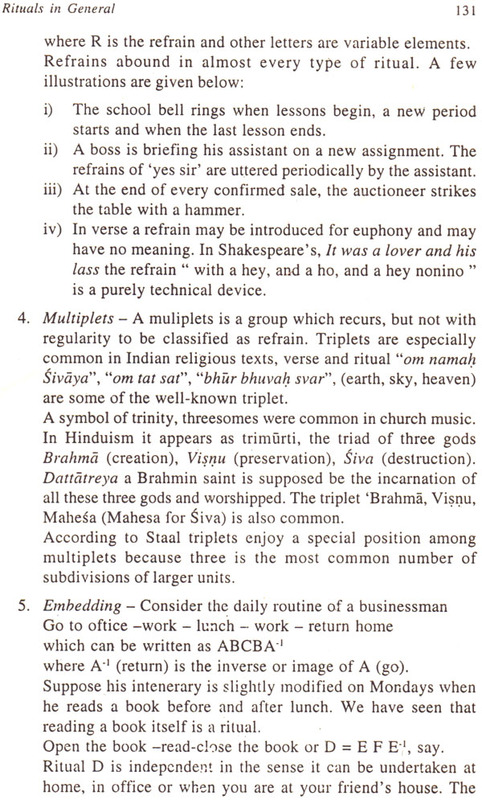 6 If you consult a person who knows Sanskrit, he is likely to say that these words are meaningless though he might recognize 'Strim' as a variant of 'stri' which means woman. 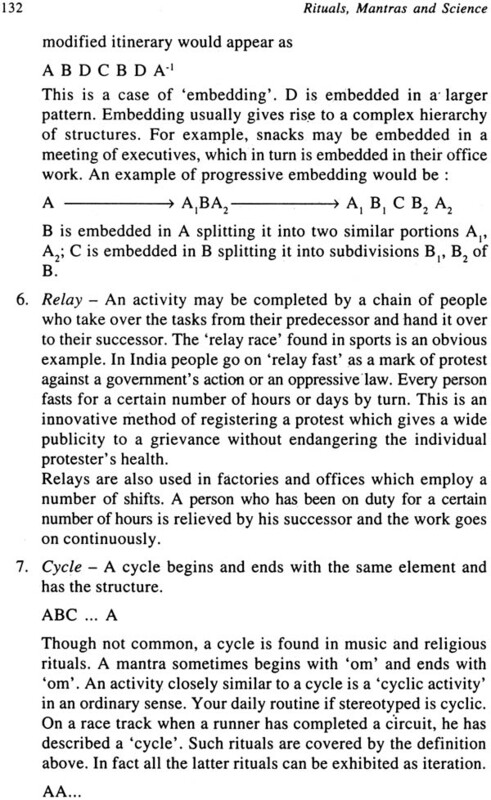 In 1, 2, and 3 you have observed a structure called 'refrain' whose meaning you must have learnt in school while studying poetry. In 4 you find that the whole mantra is repeated or 'iterated' several times. 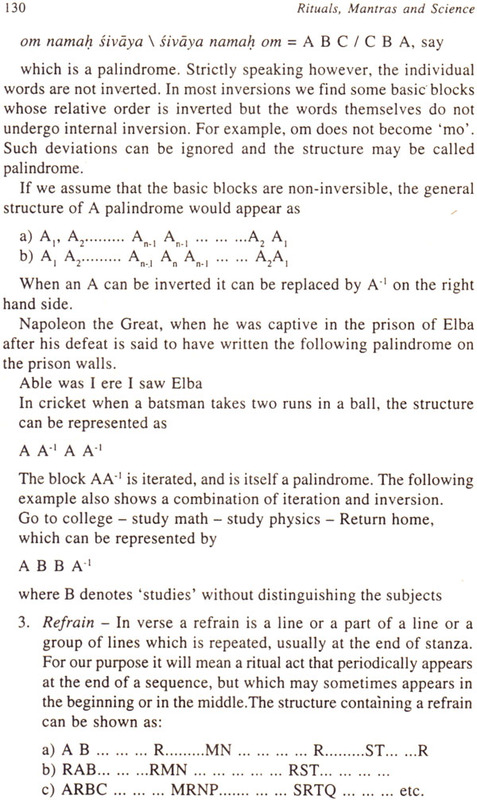 In 5 you have come across a structure called palindrome or mirror image. 6) will tell you that a mantra need not have a dictionary meaning. You may observe other rituals and you will able to detect several structures some of which occur frequently. In the syntactic analysis you analyse structures of different rituals and try to find out if there are regular patterns and similarities. What you are trying to find out whether structures, independent of meaning can tell you something about the general and special characteristics of rituals.